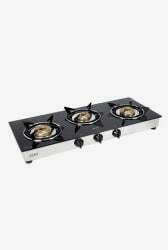 The Glen GL 1030 GT JUNIOR BB 3 Burners Gas Cooktop lets you cook your favorite meals in a jiffy. Its efficient burners can be maintained easily, and allow you to cook quickly and conveniently. It has a sleek and stylish design that is bound to complement your kitchenette. Moreover, it has a sleek and stylish design that is bound to complement your kitchenette.